If we have a single server that is used as web server and it has allocated one IP address only, then in order to have more than one website or domain running on the server, we use Virtual Hosts. This means that all websites/domains on that server will share the same web server, its configuration and the server’s resources. Virtual Hosts are widely used and popular in the shared web hosting, where the users get hosting for their website at significantly lower costs. The file should be saved inside /var/www/www.example.com/ directory. The next thing is to create configuration file that will instruct Nginx to serve files for our new domain from the directory that we have just created. Nginx for Ubuntu comes with some sample configuration files inside /etc/nginx/sites-available directory. Nginx is threating each file in /etc/nginx/sites-enabled directory as separate configuration file and is processing all these files on startup. To create new configuration file for our domain we can copy the default configuration file. Set listen variable to 80. This will make the server to listen on the default port for this host. Set server_name variable to www.example.com. 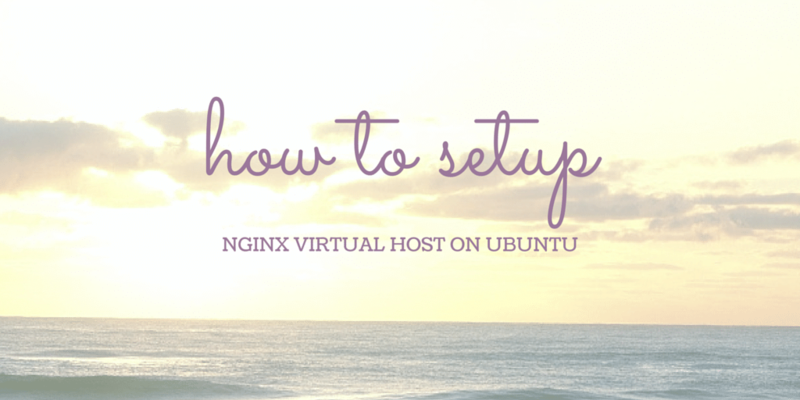 After we are done editing in order to activate the new virtual host we can either create symbolic links to this file and put it in /etc/nginx/sites-enabled directory or copy/move the actual file to /etc/nginx/sites-enabled directory. Creating symbolic link is something that is most common. After that, if we simply open our browser and go to www.example.com, we should get the content from the test index.html page that we have created earlier.